Well, not any more, thanks to Mineral Design's Barstow system (a rad concept to carry a chain tool within your handlebar end caps!) and Mini Bar tool (a multi-tool that carries all the bits you'd need in a compact size). I think they're really worth a look, and if you like their build quality and attention to detail as much as I do, you may want to help kickstart these products! Click here to check out the kickstarter. Check out this info directly from the horse's mouth (well from Justin & Mike, and their press release). The Mini Bar is a lightweight mini tool that’s built to last. The compact shape allows it to be stored easily in a jersey pocket, saddlebag, or backpack while the unique handle design provides the leverage and comfort of a full size tool. The TIG welded, high strength steel handle has 3 positions to accept ¼” hex bits which are held in place with neodymium magnets. The bits are stored in a tray that attaches to the handle magnetically. 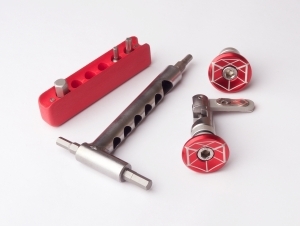 The tool ships with 2, 3, 4, 5, 6, 8mm hex, T25 Torx, Phillips and Flat screwdriver bits; providing users with the most commonly needed sizes for road or trail side repair. The Barstow System is a new way of making use of the space in the grip section of your handlebar. The Barstow Chain Tool is a high quality chain tool with quick-link storage, hidden behind a handsome bar end cap. The chain tool was designed with a rotating handle,allowing it to follow the curvature of any handlebar. The handle features magnetic storage for the quick-link and a spring washer around the pivot to prevent rattling when traversing rough terrain. The Barstow Chain Tool includes a matching cap for the other side and there are already plans to expand the lineup with more tools or storage solutions in the near future. Barstow Caps are available in red, black, and silver anodized. Mineral Design is a new company focused on product design. Justin and Mike founded Mineral Design over a shared interest in cycling and the outdoors. Both are mechanical engineers with a broad based experience ranging from the cycling and motocross industry, to consumer electronics, to construction equipment large and small.